This page holds all of our releases for the Atari series of computers. New releases will be found at the top of the page. MORE was New Beat's contribution to the demo competition at Sommarhack 2018 in Dalarna, Sweden. It was voted best demo in the competition. If you like the demo and want to show your appreciation, please consider giving it a thumbs-up at Poeut. Thanks! Nemesis Indicator is a small memory resident program for Atari Falcon030 computers equipped with the Nemesis accelerator from Titan Designs or the Phantom accelerator from Phanatic. Nemesis Indicator displays the current Nemesis state (16/32 MHz, 20/24 MHz, 24/48 MHz) in the upper right corner of the screen and allows the state to be changed by a simple mouse click. Since version 1.1, the indicator graphics can be customized and a set of predefined indicators are included. New in version 2.0 is a CPU power saver feature that, when enabled, will turn off the Nemesis after a specified number of minutes of no user activity. Whenever user activity is detected again, the most recent Nemesis state will be restored. Version 2.0 also comes with a configuration CPX for the Atari XControl Panel, a larger selection of indicator graphics, and the complete source code (in assembly language and C). This little intro for the Atari Falcon030 was New Beat's contribution to the demo competition at Sommarhack 2017 in Dalarna, Sweden. It was voted sixth best demo in the competition. The 3-in-1 monitor adapter is a small piece of hardware that plugs into the monitor port of the Atari Falcon030. 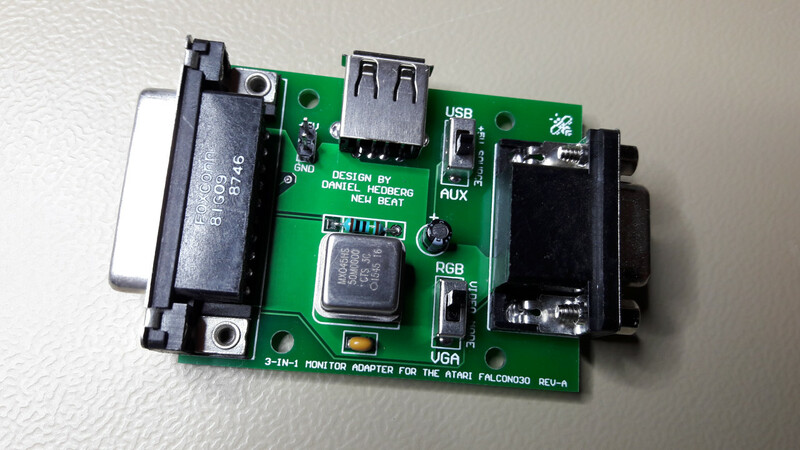 Its main purpose it to make it possible to connect the Falcon030 to a monitor using a standard VGA cable, but it also provides a switch to toggle between RGB and VGA video modes (useful for monitors that accept both RGB and VGA frequencies), and a pixel clock signal to the Falcon030 video chip (to enable higher screen resolutions) compatible with the Blow-Up software. Detailed information on the monitor adapter can be downloaded by clicking the Download button to the right. The adapter is available in exxos store. 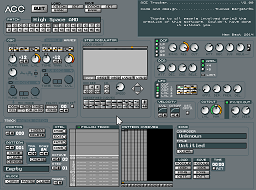 ACE is a complete 16-bit synthesizer for Atari Falcon030 compatible computers. It features one of the most advanced sound engines ever made for the Atari series of computers. ACE is the gathering title of two products, ACE MIDI and ACE Tracker. Both applications use the same sound engine which enables musicians from both worlds to exchange sounds and ideas even if the method of making music is completely different. There are some soft synthesizers already available for the Atari Falcon030, but none of these has the functionality of ACE, such as filters and MIDI support. ACE is aimed towards musicians whom want something completely new, easy to use, inspirational and fun to make music with. This is the full version of ACE Tracker, a soundtracker based on the ACE engine. Version 2.0 is major update with many new features as well as quality enhancements. The user guide has been updated and is available in the Adobe PDF format and can be downloaded by clicking the link to the right. Some of the new features of version 2.0 are listed below. MagiC has a fixed keyboard configuration and if it does not match your actual keyboard, it may be hard to find out what key to press to get the character you want, or even worse, some letters of your spoken language may not be accessible by a single key press at all. The Magic Keyboard Patch will update the MAGIC.RAM file with a new keyboard configuration. Currently two predefined configurations are included: Swedish and English (UK). If none of the predefined keyboard configurations suits you, it is possible to create your own. Version 1.1 fixes compatibility issues with older Atari computers and an incorrect key mapping in the CUSTOM.KBD file. Replace - ACE Tracker replay library. Use this replayer to play ACE Tracker modules (AM) in your own productions. Includes library, function defines and an example source in asm. ACE MIDI fits perfectly into any studio as it has a wide range of possibilities. Use the wave oscillators to create warm, cold, smooth, funny, weird, strange sounds, or load some samples to create that perfect beat. Everything is easily controlled by a number of devices. Use the LFO for vibrato, tremolo and wah-wah effects, the STEP MODULATOR on vocals to achieve "Cher singing" effects. All this in 16 bit resolution. Tap your sounds individualy through 4 outputs to your favourite effect box and add reverb, distortion or what ever you feel like, or use the internal effects to give your sounds that extra touch. The sounds in ACE MIDI ranges from retro chip-blip-blop sounds to multi-sampled pianos, strings or what ever you want to do. All this nicely packaged in a easy to use interface. Please note that the demo version is restricted in many ways and that you need to register ACE MIDI to get the full version. Click here for registration details. The latest full version of ACE MIDI is 2.0 (released in June, 2014) and is available to registered users only. Finally an update of the FlexTrax soundtracker for Atari Falcon030 compatible computers. FlexTrax features an user-friendly graphical interface in high resolution (640x480 pixels) with a built-in sound sample editor. Much have changed and many new functions are introduced in this new version of FlexTrax. Version 0.9 has support for both the AVR and WAV sample formats and the sample editor has been greatly improved. FlexTrax supports the standard MOD file format (up to eight channels) for compatibility reasons but also features a new enhanced module format FLX. The FLX format is an extended version of the standard MOD file format with support for real-time sound effects like reverb and delay. The replay routine used in FlexTrax was first developed for our platform game Willie's Adventures. If you create a module that makes use of the real-time effects in FlexTrax, please send us a copy of it! Thank you! A patch for MagiC (the multitasking operating system from Application Systems Heidelberg). The patch forces MagiC to skip the check for IDE hard drives on Atari Falcon030 compatible computers and Atari ST computers equipped with the H&N Multiboard. On systems not equipped with IDE hard drives this speeds up the boot-up sequence dramatically. Version 2.2 of the patch is compatible with MagiC 6 as well as all earlier versions of MagiC. This intro was supposed to be released at the "Alternative Party" 1998 held in Finland, but unfortunately it wasn't finished in time. The intro for the 24th issue of the Falcon030 version of Maggie, the diskmagazine from Reservoir Gods. Blue was New Beat's contribution to the 4kB intro competition at the QuaST 1997 party in Poland. It was voted second best intro in the competition. The second preview of the the platform game "Willie's Adventures" for Atari Falcon030 compatible computers. Now with even better graphics and sound, animated enemies, larger levels, parallax scrolling, improved animations, and much more! This demo was made for the demo competition at the Nordic Atari Show 1996 in Gothenburg, Sweden. It was never intended to be a serious contribution. It was done in a couple of hours and just for the fun of it. Enjoy! The first preview of the platform game "Willie's Adventures" for Atari Falcon030 compatible computers. Featuring parallax scrolling with 64 foreground colours and four background colours, eight channel 8bit/50KHz sound, Jaguar Joypad support, VGA and RGB monitor support, and much more. This script is written in RAT-Script and is intended to be used with the RATSoft/ST BBS System. In RATSoft/ST local mode the script makes it possible to copy files marked for download to a specified path.